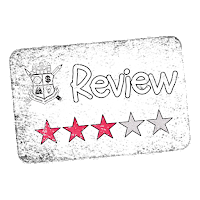 This week's Frugal GM Review is a bit different in that I picked up an item being offered on DTRPG in two different formats. 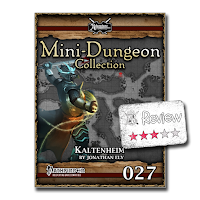 Mini-Dungeon #027: Kaltenheim is available as both a download and a printed card with a "special" of getting the card and PDF at the same price as just the card. 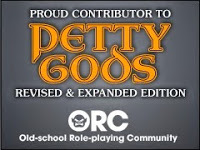 I have never purchased a printed product from DTRPG before so more than anything I wanted to see how that all worked out. The shipping option I picked was the cheapest and I expected the whole affair to take a couple business weeks. It was maybe eight days between the order and delivery. The 8" x 10" print was well packed and protected. The PDF portion of the purchase is also 8" x 10" and locked-down, but at two pages in length doing much more than printing (which is allowed) isn't a big deal. There is a few bits of text that look like they are external hotlinks, but there is actually only one hotlink.....on page two, taking you to the Adventure-A-Week website. I cannot judge the suitability of this particular adventure for Pathfinder characters of level 9, but I can look at the adventure as a whole. Honestly I wasn't impressed. The given map is a bit dark and lacks a key, so I'm not sure what the red skull & crossbones mean. Any adventure that makes me scratch my head in the 1st paragraph kind of puts me off immediately. The flavor-text depicts this terrible foe that leaves no survivors, but the foe has a known description and name? As I'm reading the room descriptions with possible encounters, the overwhelming majority of these rooms are just copies of each other. There is a lot of "this chamber is identical to"......That is OK to a certain amount, but some information is specifically vague, which I just don't get. There are "several massive" foes guarding this complex and they can call out to each other. "Up to three" can work together, but the GM doesn't get a head-count for the overall population. Does every one of these rinse & repeat encounters get three of these creatures? There is also a given name for.....something....mentioned at least twice as your read through the adventure and that something isn't actually identified until the next-to-last paragraph. I only found one typo, but I wasn't actually looking for typos. I know I have my fair share of them when I write and unless there are some glaring ones I don't generally get too worked up about that. Overall though, I found this adventure a bit confusing and cumbersome. Even with the shortcuts of "this chamber is identical to...." there seems to be a lot of repeat text. I'm not a fan of having to flip back & forth between two pages to get the information I need. Since realistically there are only four total creatures in this adventure I think room could easily have been made for stats or barring that (I realize that could be a license issue) referential information, like sourcebook and page, could have been provided. I'm a bit "meh" on the printed card aspect of this purchase. While it is a great print I don't see it being as useful in-game as far as the added expense goes. Spending $1 on the PDF could be worth the idea alone, but I think the GM might be better served with just using the idea and the map to create their own adventure instead of running with this as-is.